If you ask someone, what is the most important instrument in Rock music, there is no doubt, the answer will be - "The Guitar". Playing guitar is a great fun for any age. Since the 50's the guitar is a heart and soul of any Rock band. Guitar styles include Classical Rock'n'Roll, Rockabilly, Hard Rock, Punk, Flamenco and Blues. 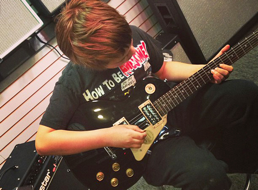 MELODY MUSIC SCHOOL offers guitar lessons for people of all ages and all skills.